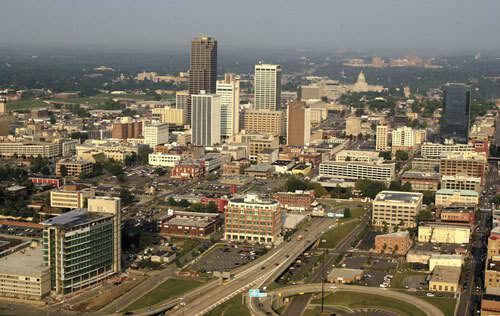 Little Rock is the capital and the most populous city of the U.S. state of Arkansas. It is also the county seat of Pulaski County. It was incorporated on November 7, 1831, on the south bank of the Arkansas River close to the geographic center of the state. The city derives its name from a rock formation along the river, named "le petit rocher" by the French in the 1720s. The capital of the Arkansas Territory was moved to Little Rock from Arkansas Post in 1821. The city's population was 193,524 at the 2010 census. 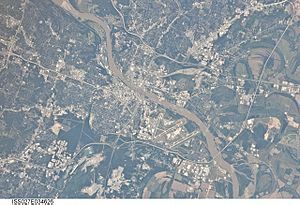 The six county Little Rock-North Little Rock-Conway, AR Metropolitan Statistical Area (MSA) is ranked 75th in terms of population in the United States with 724,385 residents according to the 2013 estimate by the United States Census Bureau. 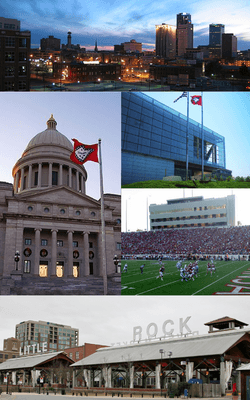 Little Rock is a cultural, economic, government, and transportation center within Arkansas and the South. Several cultural institutions are located in Little Rock, such as the Arkansas Arts Center, the Arkansas Repertory Theatre, and the Arkansas Symphony Orchestra, in addition to the hiking, boating, and other outdoor recreational opportunities. 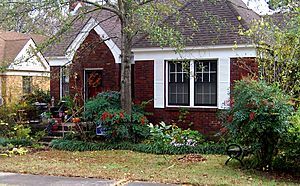 Little Rock's history is available through history museums, historic districts or neighborhoods like the Quapaw Quarter, and historic sites such as Little Rock Central High School. The city is the headquarters of Dillard's, Windstream Communications, Acxiom, Stephens Inc., University of Arkansas for Medical Sciences, Heifer International, the Clinton Foundation, and the Rose Law Firm. Other large corporations, such as Dassault Falcon Jet and LM Wind Power have large operations in the city. State government is a large employer, with many offices being located in downtown Little Rock. Two Interstate highways, Interstate 30 and Interstate 40, meet in Little Rock, with the Port of Little Rock serving as a shipping hub. Little Rock derives its name from a small rock formation on the south bank of the Arkansas River called "le petit rocher" (French: "the little rock"). The "little rock" was used by early river traffic as a landmark and became a well-known river crossing. The "little rock" is across the river from "big rock," a large bluff at the edge of the river, which was once used as a rock quarry. Little Rock was named for a stone outcropping on the bank of the Arkansas River used by early travelers as a landmark. Le Petit Rocher (French for "the Little Rock"), named in 1722 by French explorer and trader Jean-Baptiste Bénard de la Harpe, marked the transition from the flat Mississippi Delta region to the Ouachita Mountain foothills. Travelers referred to the area as "the Little Rock," and the landmark name stuck. 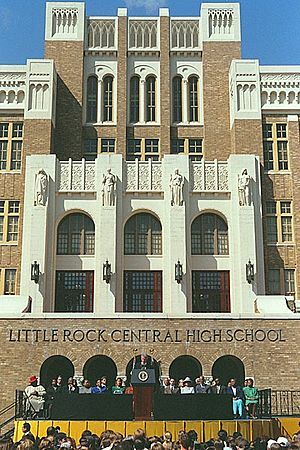 Little Rock is located at (34.736009, −92.331122). Inside Little Rock's city limits, there are numerous different neighborhoods. They are Apple Gate, Birchwood, Breckenridge, Broadmoor, Brodie Creek, Candlewood, Capitol Hill, Capitol View, Capitol View/Stifft's Station, Chenal Ridge, Cloverdale, Colony West, Downtown, East End, Echo Valley, Fair Park, Foxcroft, Geyer Springs, Gibraltar Heights, Granite Mountain, Gum Springs, Hall High, The Heights, Highland Park, Hillcrest, John Barrow, Leawood, Mabelvale, Mushroom Pass, Oak Forest, Otter Creek, Parkway Place, Pleasant Valley, Quapaw Quarter, River Mountain, River Ridge, Riverdale, Robinwood, Rock Creek, Rosedale, St. Charles, Santa Fe Heights, South End, South Little Rock, Southwest Little Rock, Stagecoach, Sturbridge, University District, the Villages of Wellington, Wakefield, West End and Woodland Edge. The 2013 U.S. Census population estimate for the Little Rock-North Little Rock-Conway, AR Metropolitan Statistical Area was 724,385. The MSA covers the following counties: Pulaski, Faulkner, Grant, Lonoke, Perry, and Saline. The largest cities are Little Rock, North Little Rock, Conway, Jacksonville, Benton, Sherwood, Cabot, Maumelle, and Bryant. As of the 2010 census, there were 193,524 people, 77,352 households, and 46,488 families residing in the city. The population density was 1,576.0 people per square mile (608.5/km²). There were 84,793 housing units at an average density of 729.7 per square mile (281.7/km²). The racial makeup of the city was 48.9% White, 42.3% Black, 0.3% Native American, 1.7% Asian, 0.03% Pacific Islander, 1.28% from other races, and 1.28% from two or more races. 2.7% of the population is Hispanic or Latino. Kiplinger names Little Rock as the #1 place to live among metropolitan areas under one million people in July 2013. Arkansas Arboretum – Located at Pinnacle Mountain, it has a trail with flora and tree plantings. Arkansas Arts Center – The state's largest art museum, containing drawings, collections, children's theater productions, works by Van Gogh, Rembrandt, and other works in eight art galleries, a museum school, gift shop and restaurant. Founded in 1976, the Arkansas Repertory Theatre is the state's largest nonprofit professional theatre company. A member of the League of Resident Theatres (LORT D), The Rep has produced more than 300 productions, such as 40 world premieres, in its building located in downtown Little Rock. Producing Artistic Director, Robert Hupp leads a resident staff of designers, technicians and administrators in the creation of eight to ten productions for an annual audience in excess of 70,000 for MainStage productions, educational programming and touring. The Rep produces works that range from contemporary comedies and dramas to world premiers and the classics of dramatic literature. Outside magazine named Little Rock one of its 2013 Best Towns. Dozens of parks such as Pinnacle Mountain State Park are located in Little Rock. American Taekwondo Association World Headquarters. The American Taekwondo Association [ATA] is based in Little Rock where it hosts the World Taekwondo Championships each summer. 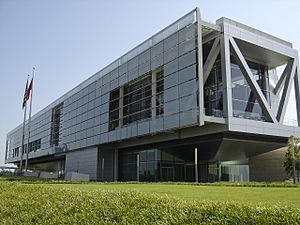 The ATA World Headquarters is also headquarters for all of the Songahm Taekwondo organizations such as the American Taekwondo Association, the Songahm Taekwondo Federation and the World Traditional Taekwondo Union. These combined organizations have millions of members in the USA and worldwide. Little Rock, Arkansas Facts for Kids. Kiddle Encyclopedia.